Apo-Prednisone (Prednisone) is a corticosteroid medication which can be used as an immunosuppressant. Doctors prescribe it to treat many different conditions, such as arthritis, severe allergies, multiple sclerosis, lupus, cancer, Crohn's disease, asthma, adrenocortical insufficiency, pericarditis, myasthenia gravis, nephrotic syndrome, migraine, cluster headaches, thyroiditis, laryngitis and various other conditions which have not been listed here. Apo-Prednisone (Prednisone) is a corticosteroid medication which can be used as an immunosuppressant. Doctors prescribe it to treat many different conditions, such as arthritis, severe allergies, multiple sclerosis, lupus, cancer, Crohn's disease, asthma, adrenocortical insufficiency, pericarditis, myasthenia gravis, nephrotic syndrome, migraine, cluster headaches, thyroiditis, laryngitis and various other conditions which have not been listed here. It has also been used in combination with other medicines to prevent an organ transplant from been rejected. This medicine works by preventing the body from releasing substances which can cause inflammation and other symptoms. In addition to this, it can suppress the activity of the immune system, making it effective at treating the conditions listed above. 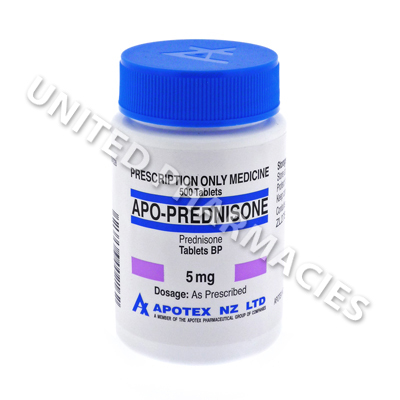 Apo-Prednisone (Prednisone) tablets are used to treat a wide range of medical conditions. Because of this, different dosage regimens will be required for each patient, depending on the condition being treatment. Therefore, a full medical assessment will be required before starting treatment, and it is essential that you only take the amount your doctor prescribes for you. When used as an anti-inflammatory, patients are usually prescribed anything from 5mg to 60mg, taken 1 to 4 times per day. The dosage for asthma, arthritis, myasthenia gravis and any other condition it is prescribed to treat can vary, and in all cases patients must strictly follow all dosage instructions given by their doctor. While you are undergoing treatment with this medicine, it is important that you notify your doctor if any side effects occur. Serious reactions will require you to seek medical care as soon as possible. Examples of this include problems related to vision, seizures, redness of the eyes, high blood pressure, low potassium levels and other serious side effects which have not been listed here. You should ensure that you carry an ID card or wear a bracelet that clearly states the fact that you are using corticosteroid medication. Do not have any vaccines while taking this drug unless your doctor tells you that it is safe to do so.